A landslide hit and derailed a train in northern Italy on Monday, killing 11 people and leaving some 30 injured, officials said. The accident happened near Merano, a small town close to the Austrian border about 300 kilometers (185 miles) north of Venice. With the wreckage still on the tracks, rescuers were working to pull out bodies and find possible survivors. The area was cordoned off, said Giuseppe Marazzi of the local firefighters, The Associated Press reports. According to Times Online, rescuers had to climb up from the forested riverbank to reach the train and surrounding streets were closed to allow access for ambulances and emergency services. The line began running in 2005 and is one of the most modern in the Alto Adige region. 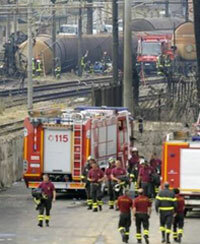 Italy suffered its worst rail accident for 20 years in June last year, when 29 people were killed when a freight train ferrying liquefied petroleum gas derailed in Viareggio, on the northwest coast, causing a series of explosions. The accident happened at around 9am this morning local time and the train - which was running on a picturesque mountain line that had only opened five years ago - had been due to arrive at Merano 45 minutes later, Daily Mail says.